If the recent story about the octopus that watched over her nest for four-and-a-half years taught us anything, it’s that there’s still much to learn about deep-sea dwelling creatures. Here’s yet another case. For the first time, scientists filmed an elusive amphipod that is like a shrimp but much larger than the cocktail variety. According to New Scientist, the Alicella gigantean that swam serenely into view as the camera was trained on a group of feeding snailfish is the first live one to be filmed. The footage was taken by the University of Aberdeen’s Alen Jamieson off the coast of New Zealand earlier this year. The scene was shot at more than four miles deep. The crustacean appeared as if it wanted to see what the snailfish were so fixated upon. 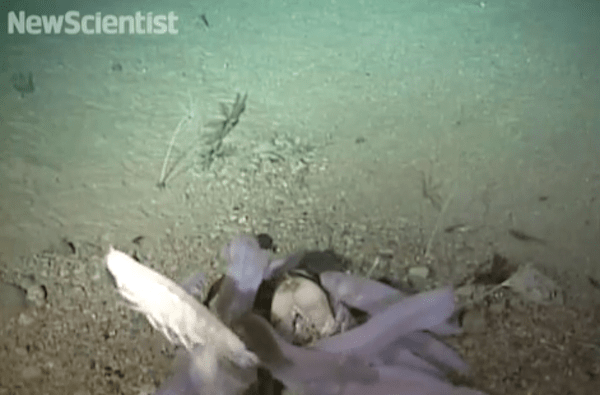 While this “shrimp-like” species is nearly 10 inches long, Jamieson told New Scientist a larger one that was about 13 inches was not caught on camera. “Life down there is anything but boring,” Jamieson said, according to New Scientist. Last year, Jamieson and his colleagues reported finding several new bizarre creatures in the Kermadec Trench. 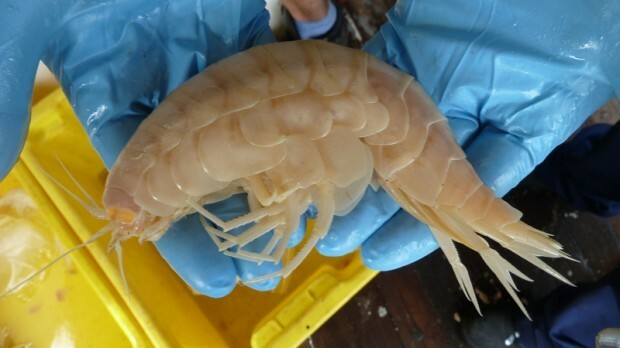 This “supergiant” type of amphipod was first found by researchers living at such depths a couple of years ago.